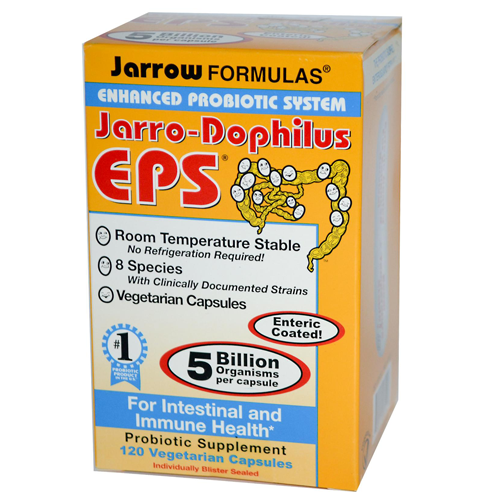 Jarro-Dophilus EPS has a guaranteed 5 billion live organisms per capsule, and being stable at room temperature makes it ideal for travelling when refrigeration is not readily available. Capsules are individually blister-packed to ensure a good shelf life. Take 1 capsule up to 4 times per day, preferably on an empty stomach, though they may also be taken with food or as directed by a qualified health care consultant. Potato starch, magnesium stearate (vegetable source), and ascorbic acid. Vegetarian capsule consists of hydroxypropylmethylcellulose and an aqueous-based enteric coating. 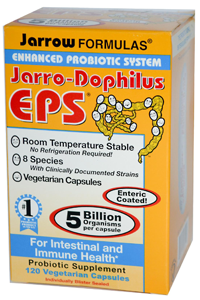 Jarro-Dophilus EPS is room temperature stable and does not require refrigeration. Refrigerating Jarro-Dophilus EPS is optional and will further extend the shelf-life, especially during the hot summer months. Blister packaging each capsule provides extra protection to the probiotic bacteria against external moisture and oxygen.